My rules for borrowing to or from family members. US Rule Vs Normal amortization. This section is for entering the original loan terms needed to create the editable payment schedule. Note that once you click the "Create Schedule" button, all but the "Loan Name" fields will be disabled. Therefore please make sure you have the correct numbers entered before creating and editing the schedule. If you will be printing the loan amortization schedule or you will be tracking more than one loan, enter the name of the loan here. Enter the dollar amount of the principal balance that coincides with the month and year you would like the payment schedule to start. Enter only numbers and no more than one decimal point (no commas or dollar signs). Enter the annual interest rate you are paying (or collecting) on the loan balance. Enter as a percentage without the percent sign (for .06, or 6%, enter 6). Note that if the interest rate changes during the repayment period it's best to create a second payment schedule starting from where rate change occured. Use the balance just prior to the rate change on the old rate schedule as the starting balance for the new rate schedule. Enter the number of monthly payments as stated in the original loan agreement. Note that if you type in the number of years below, the calculator will automatically populate the number of payments field with the correct number of months. Enter the original monthly principal and interest payment amount (without dollar sign and commas). If this is a home loan, be sure to exclude the insurance and tax portions of the monthly payment. Note that if you leave this field blank the calculator will calculate the monthly payment for you (based on the entered principal, rate, and term) when it creates the payment schedule. Select the month and enter the 4-digit year you would like the payment schedule to begin. The loan balance calculator will use the month and year to create a schedule of payments wherein each payment can be changed to match the actual amounts paid. Select the month and enter the 4-digit year you would like the payment schedule to end. Note that you can extend the schedule beyond the original term for cases where missed payments have postponed the payoff date. Select US Rule if it is illegal in your state to charge interest on unpaid interest (unpaid interest will be escrowed). Otherwise, if you select Normal then unpaid interest will be added to the principal as it occurs (causing negative amortization). Pressing the "Create Schedule" button will populate the monthly payment chart below based on the loan's original terms. You can then change any of the monthly payment amounts to the actual amounts, as well as enter any extra and/or balloon payments that you have made, or that you plan to make. If you would like to make changes to the original terms after creating the schedule, click the "Edit Loan Terms" button. Note that this will clear out the payment schedule and any changes you have made to it. So be sure to save the record under the Data tab if you'd like to keep a copy of the schedule that will be overwritten. Select the number of payment rows you wish to display at one time. The lower the number of rows, the more likely the summary results will remain in view as you make changes. Use the "Prev" and "Next" buttons beneath the displayed rows to navigate the payment schedule. Or select the desired period from the dropdown menu next to the buttons. This column will list the default payment amount for each month that falls within beginning and ending dates. You can change these to reflect instances where the actual payment made was more or less than amount listed (enter zero if payment was skipped all together). Note that the Balance column will update as you make changes. Use the fields in this column for adding late fees to the principal balance (enter fees as a negative number, e.g. enter -10 for a $10 fee), or for cases where a second payment is made during any one month (enter principal payments as a positive number). Note that the Balance column will update as you make changes. This column will display the revised month-to-month loan balance based on your entries in the Payment and Adjustments columns. Note that the loan balance calculator will recalculate this column as you adjust the payment amounts and late fees. The result fields below will update as you make changes to the editable payment schedule. Note that the results are calculated from the start date of the amortization to the end of the amortization, as entered in the top section of the calculator. The total of the amounts applied to the principle during selected repayment period. The total of the interest charges that have accrued during selected repayment period. This is the balance owed as of the last month of selected repayment period (includes the payment amount for that month). If you selected US Rule and any of your payments (less any fees) were not large enough to cover the interest charge for their respective payment periods, the unpaid interest and fees will be escrowed -- the total of which will display on this line. Otherwise, if Normal amortization is selected, unpaid interest and fees will be added to the principal in the period it occurred (causing negative amortization) and a zero will be displayed on this line. This is the balance owed as of the last month of selected repayment period (includes the payment amount for that month), plus any escrowed unpaid interest. The Loan Balance Calculator can be used to track variable payments on any monthly installment loan. This includes auto, RV, personal or student loans, certain types of promissory notes, contracts for deed, 1st and 2nd mortgages, and so on. And it can be used from either a lender's perspective, or from a borrower's perspective. Specifically, the calculator will create an editable monthly payment schedule for a time period of your choosing. From there you can then change the default payment amounts to match the actual payment amounts, and you can make adjustments to the principal balance (up or down) for any month that falls within the selected time frame. Clear out a skipped or overdue payment. Enter a late fee or penalty. Reduce or increase the principal balance. Plus, you can set the calculator's amortization method to either US Rule or Normal (negative amortization). Then, once you have the payment schedule changed to match the actual, you can view and print out a revised loan amortization schedule. And finally, you will also have the option of downloading a .csv file for importing into Excel or Open Office Calc spreadsheets. Note that the member version of this calculator includes a feature for downloading a .csv file for importing into Excel or Open Office Calc spreadsheets. If the principal repayment is ahead of schedule, I recommend you use the Loan Pay Off Calculator instead. Or, if you are looking to calculate the current balance on a loan that you have been making the prescribed monthly payments on, please visit the much simpler Remaining Balance Calculator. Or, if you need to keep track of the running balance on a promissory note or personal loan, check out the Daily Interest Loan Calculator. It allows you to calculate simple or compounding interest between dates, or for a given number of days, or over the course any number of separate transaction periods. If you will be printing the loan amortization schedule or you will be tracking more than one loan (Cloud subscription), enter the name of the loan. Enter the original principal amount borrowed at the beginning of the payment schedule. Enter the annual percentage rate of the loan. Enter the original loan term in number of monthly payments. Enter the original monthly payment amount. Note that if you leave the payment field blank the calculator will calculate the monthly payment amount for you when you create the payment schedule. Select the month and enter the 4-digit year of the date to start the payment schedule. Select the month and enter the 4-digit year of the date to end the payment schedule. Select either the "US Rule" or "Normal" amortization method. Press the "CreateCreate SchCreate Editable ScheduleCreate Editable Payment Schedule" button to create the editable payment schedule. Use the Next and Previous buttons, or the period select menu, to view and change any payment amounts that were different from the prescribed payment amount. Use the adjustment column to add late fees (entered as negative numbers) or to add extra principal payments. Once you have made all of the payment revisions, press the "Show Schedule" button. This will display a scrollable revised amortization schedule, followed by a "Printer Friendly Schedule" button for printing the schedule, and a "Download CSV File" button for downloading and importing the revised schedule into Excel or Open Office Calc. For friends and family. Plus, a mini negative amortization calculator. Never borrow money from friends or relatives. Never lend money to friends or relatives. Why? Because all too often I have seen close relationships permanently dissolved by matters of money -- namely when one borrows money from the other. Even in cases where one person is paying the other as per the repayment schedule, each looks at the other differently -- with "differently" ranging from not looking the other in the eye as often as they used to, to avoiding any contact with the other at all. For that reason, and because I'm a very family oriented person, I simply refuse to put my relationships with friends and loved ones at risk over money. If I don't have the money to give to them as a gift without putting myself in financial peril, they don't get the money. Instead I simply tell them that I value our relationship too much to put something so dangerous between us, and then come up with other ways I might be of assistance. On the other hand, if I do give a friend or relative a sum of money, and that person is moved to pay me back, they know its only because they want to and not because I was expecting it. In that light, the repayment is simply gift back to me. US Rule: Unpaid interest and late fees are escrowed, or banked, and added to the end of the loan. 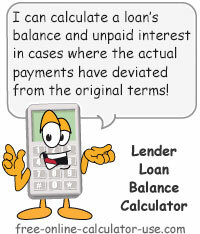 Normal: Unpaid interest and late fees are added to the loan's principal balance in the payment period they occur. This results in charging interest on unpaid interest and fees, which is commonly referred to as Negative Amortization. From the borrower's perspective, negative amortization can be very costly -- especially if the missed payment occurs early on in the repayment schedule. The following mini calculator helps to illustrate this point.